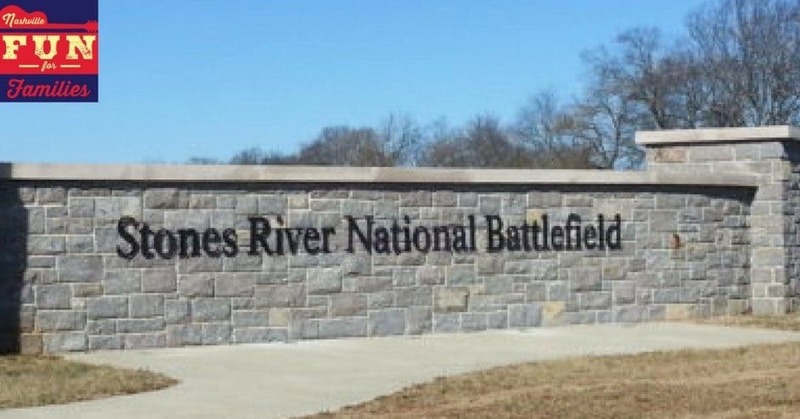 Stones River National Battlefield is located in Murfreesboro, TN. The 570 acre park commemorates the Battle of Stones River.This battle was fought during the Civil War from December 31, 1862 to January 2, 1863. As you drive in the entrance of the park, resist the urge to stop at the various markers along the way. It’s best to start at the Visitor Center. There is ample parking in front. Once inside, you will be able to speak to a park ranger (or two) and plan your tour. Tours are self guided which allow you all the time you need to explore and learn at your own pace. Once you get your maps and your tour plan sorted, spend some time looking at the exhibits inside the Visitor’s Center. There are several rooms full of displays and information about the Battle of Stones River. There is also a video presentation. If you go with young children, I would suggest skipping the video. It does deal with a very bloody military subject matter and it runs a bit long. It’s not inappropriate or too long for school age kids and up in my opinion. Once outside the center, you have a few choices. To the right, is the National Cemetery. 6 thousand Union soldiers are buried here. More than 2500 are unknown. The actual battlefield tour is quite long. To see every point of interest, take the self guided car tour. There are numbered markers at each stop. A cell phone tour is available by calling 1-585-797-0076. We chose to do a more limited walking tour. There are several important areas that you can tour this way. It is quite a lot of walking so keep that in mind if you have little ones or older people with you. Most of the main areas are paved so strollers should give you no trouble. Stones River Battlefield offers bicycle tour several times a year. It takes about 90 minutes to take this tour. They also offer special programs throughout the year and host group events for schools, scouts, etc. I visited with teenagers and they wanted to read everything and see everything. So it took us a long while to visit. But if you are touring with younger children, it may go quicker for you. Don’t think of Stones River Battlefield as a ‘once in a lifetime’ trip. Take your kids several times as they grow. They (and you!) will probably get something different out of the experience each time. And while the history of this hallowed ground is absolutely the most important part, don’t overlook the fact that it is a beautiful natural area. If you live within an hour drive, load the kids and a picnic up when the weather is nice and spend a nice, FREE day at this park. Our visitor center hours are now 9 AM to 5 PM. We are closed on Thanksgiving and Christmas days.